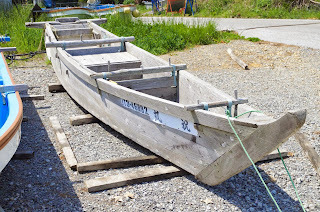 Today was our first day building the boat in Tohoku. In the course of the day Mr. Murakami made the bottom of three planks, edge-nailed together. We assisted from time to time, but mostly spent time cleaning, fetching tools, and taking notes and photographs. I was quite surprised by the number of techniques he employs that I have never seen before. 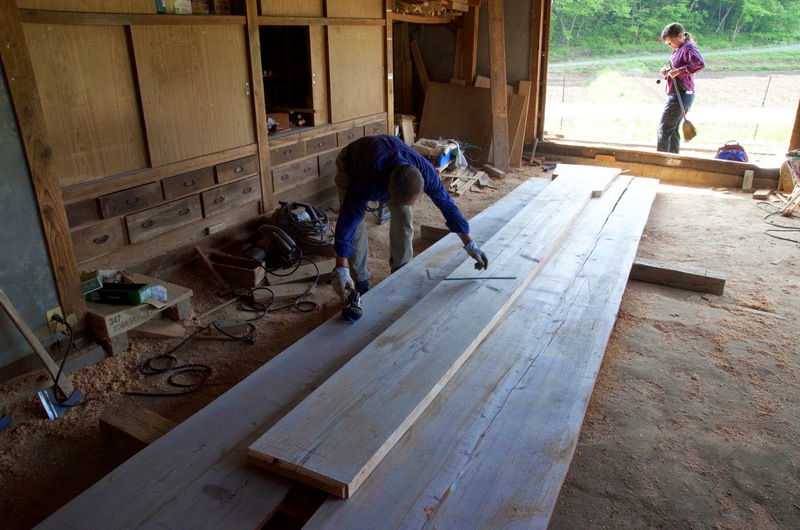 Mr. Murakami is a second generation boatbuilder, having been taught by his father. He’s lived in the same house all of his life. 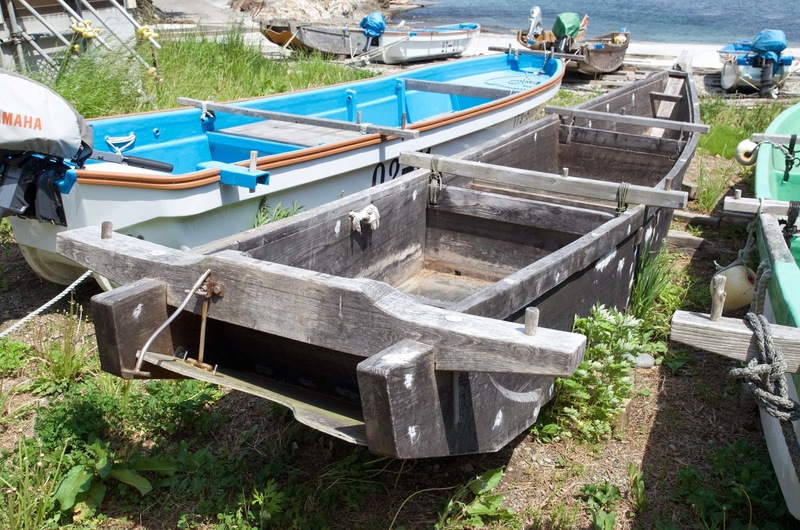 His home is the first on the road rising up from a gorgeous small cove that is full of fishing boats, most built by him. 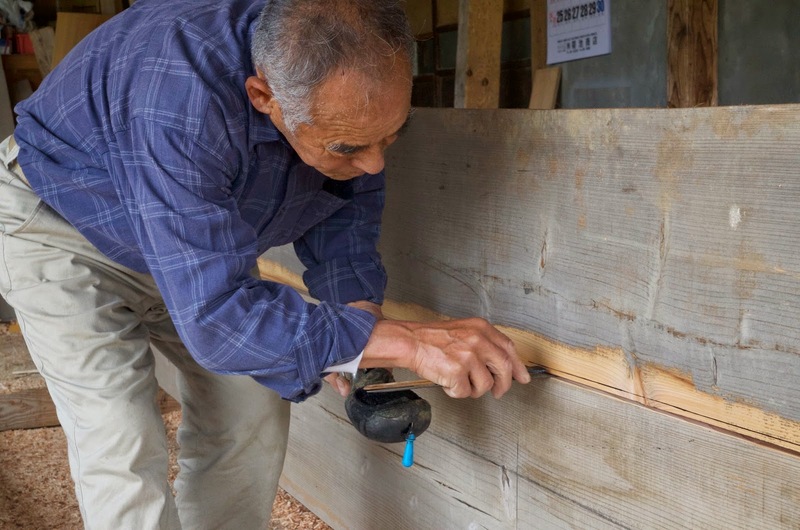 He told us today that the 2011 tsunami just reached his workshop and the rice fields across the road from his home held three fishing boats once the waters receded. 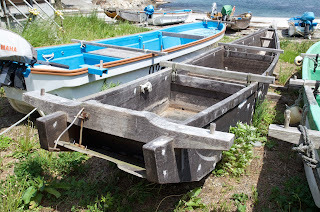 The day before we started Angela and I visited the cove below Mr. Murakami's house where I first saw his boats. Many were still there and Murakami san explained some floated away in the tsunami rather than being destroyed outright. 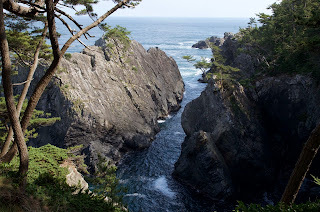 This coastline is extraordinarily beautiful. This the the view just a five minute walk from where we are staying. 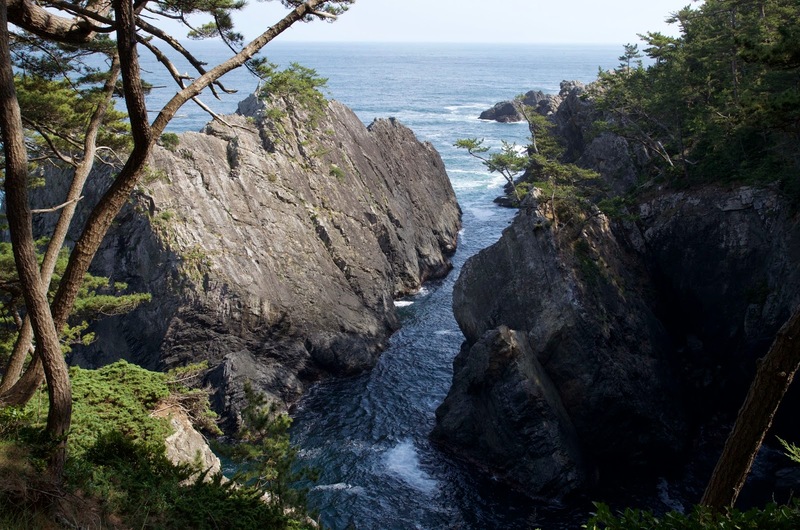 The region is characterized by forested mountains and granite cliffs along the sea, with many small natural harbors. Mr. Murakami doing some initial layout work on the three planks which comprise the bottom, or shiki of our boat. 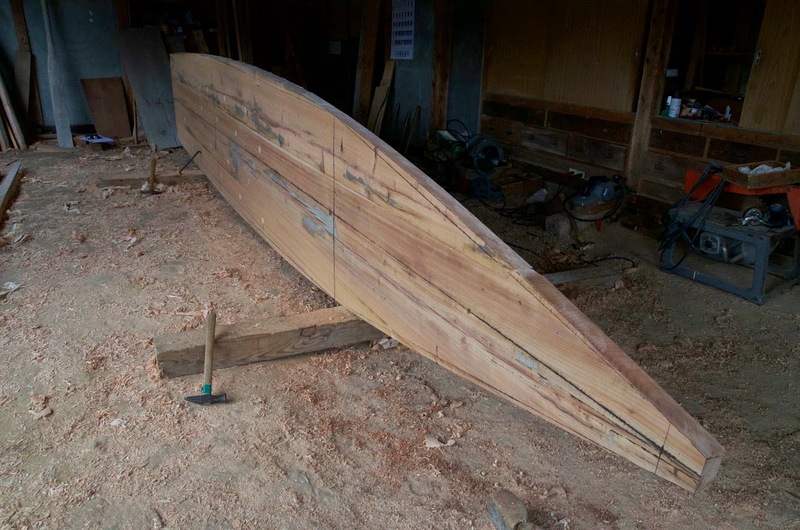 Note the thick batten, which is necessary because this boat is built of much thicker material than a Western boat of the same size. 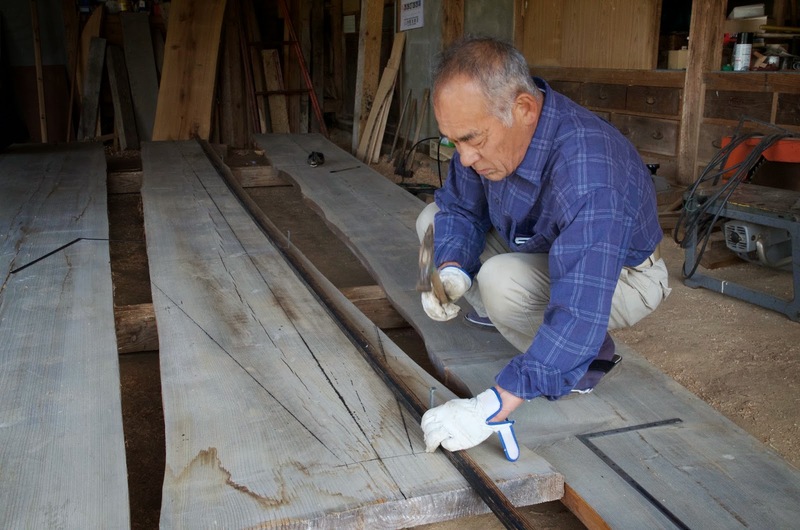 With the center plank edges trimmed, Mr. Murakami lays it on top of the two side planks and traces the joint. Angela is standing in the doorway of the shop. She and I mostly took notes and photographs, though Mr. Murakami later got us involved in the work. We then stacked the planks with a spacer between them and scribed the fit. 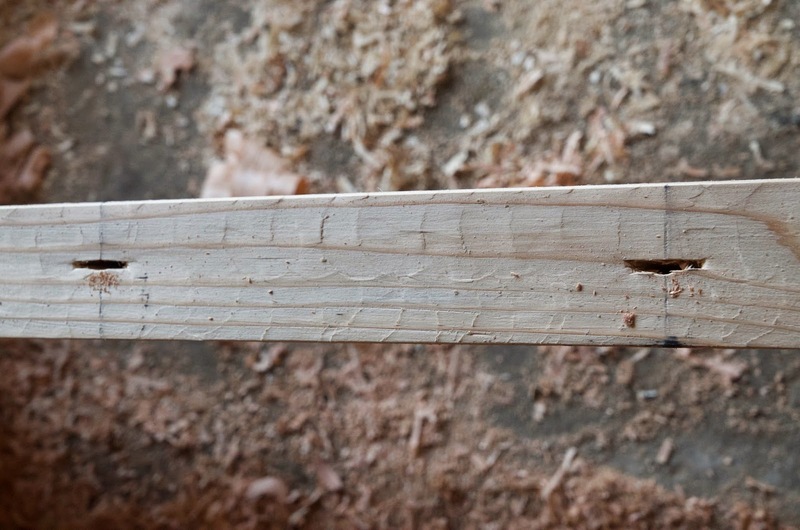 We pounded the edges just prior to fastening. 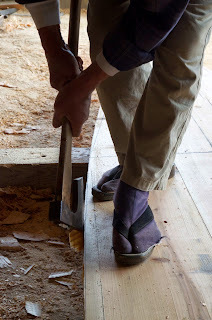 We also burnished the edges with the handles of our hammers, a technique I have never seen before. 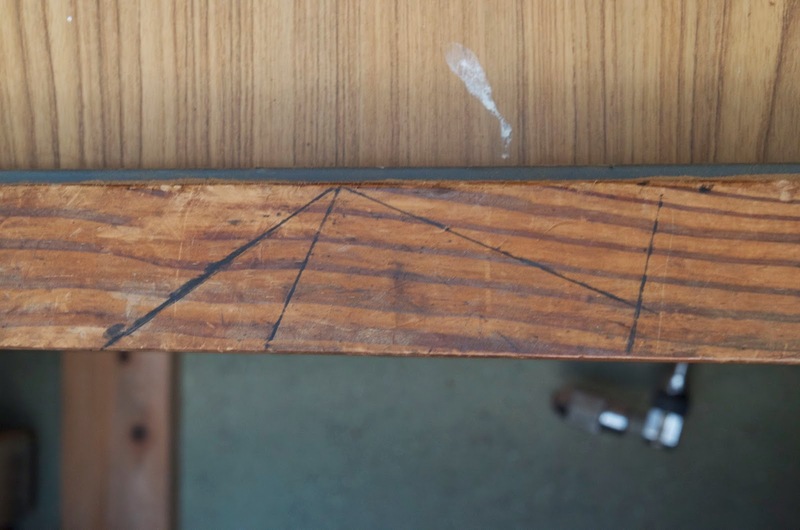 I asked Mr. Murakami if he had his dimensions written down anywhere and he said no, but he pointed to these bevels he recorded on a beam in the shop. 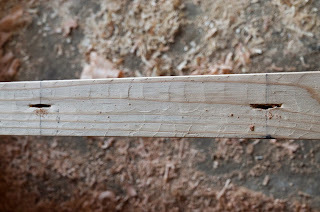 Using the axe to bevel the edge of the bottom. The results of our first day's work, the bottom is completed. Tomorrow we bend it using an open fire.